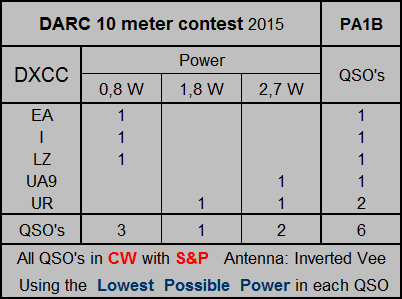 The DARC 10 meter contest is a contest with a length of 2 hours, organised by the DARC. (German Radio Society) Because of the very short distance to Germany and the very short duration, I did not expected to make many QSO's, but I was very curious how it would go. In total I made 6 QSO's with search and pounce. Vorige week ben ik naar Museum IJsselstein geweest. 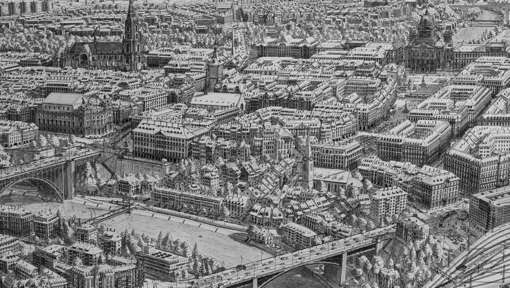 De tentoonstelling: De stad in MIJ toont de bebouwde verbeelding. Schilderijen, bijzondere 360 graden foto's, wandkleden en objecten. Ik ben bijna in de tekening gekropen, om alle details zoals schoorstenen, dakkapelllen en hun schaduwen goed te kunnen bekijken. 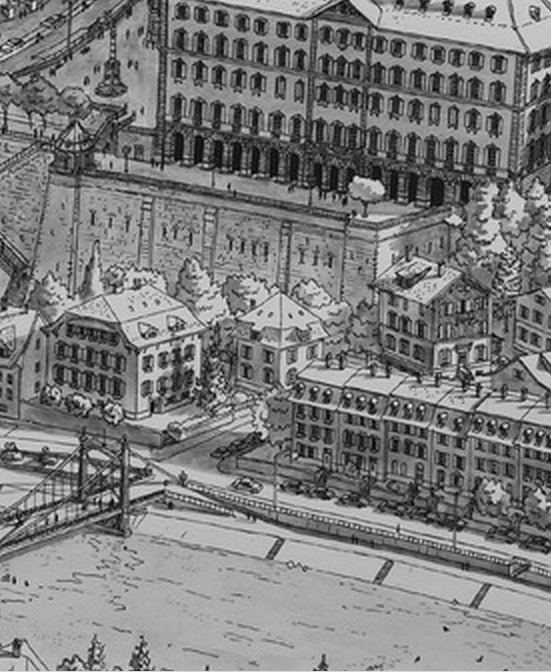 De stad in MIJ. Bebouwde verbeelding van realistisch tot utopisch. Museum IJsselstein. Nog te zien t.e.m. 15 maart 2015. 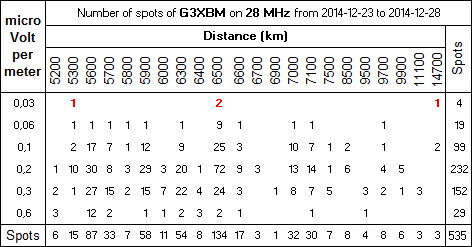 The propagation changes from day to day, as you can read in the blog of Roger G3XBM. 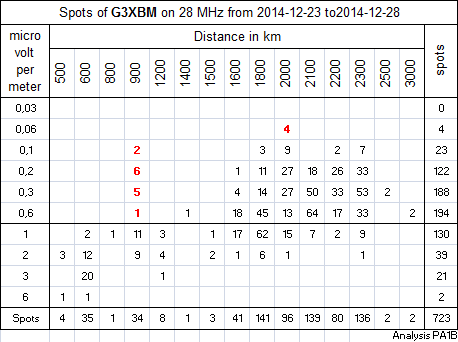 on the 24th and the 28th of December 2014.
with a calculated lowest possible power of 5 milliwatts. On the 28th the propagation has a short peak at 14:52 UTC. Around that time there are seven successive spots, every two minutes. In the spot of 16:36 utc, the full power of 500 mW is needed, to be spot. hi. In most of the spots, the calculated lowest possible power is 50 mW or less, on both days. This means that, if you would use CW instead of WSPR, that 1 watt (20 * 50 mW) could be used to make QSO's in CW. I collected data from the WSPR database, to make the diagrams. The first two diagrams, show spots that are collected over several days. The strongest spots are given in red. The first two diagrams show the calculated electrical field strength in micro volt per meter. If spots show the same field strength, the voltage on the antenna will be the same, for a simple wire antenna. The difference between the successive values of the field strength is 5 dB. This is about one S-point, since 6 dB is one S-point. The lower the value, the better the propagation. So 0.03 micro volt/meter is about 1 S-point stronger than 0.06 micro volt/meter. The strongest (in red) spots show the same field strength. Notice that the spots over 5300, 6500 and 14700 km were made with the same field strength at the receiving antenna, so the strength of the signal that arrived on the antenna was the same in these three spots. Further analysis shows which receiving stations have Excellent Ears. See the spots in red. The spots in red in the table below correspond to the spots in red in the tables above. The stations with excellent ears. I was wondering, how much power would be needed to make CW QSO's. 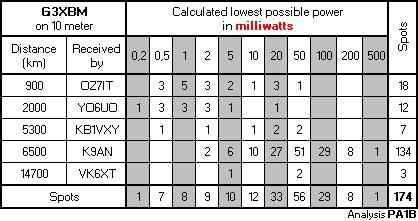 The diagram below shows the Calculated lowest possible power (Click)in milliwatt for each spot. 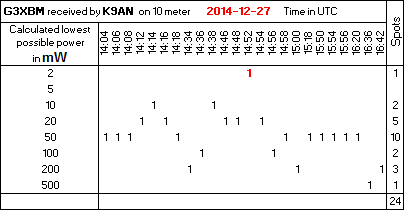 For the strongest WSPR signal, received by K9AN the calculated lowest possible power is 2 mW. To be received in CW, a power of 20 * 2 = 40 mW would be needed. This does not surprise me a bit, since I made a CW contest QSO with K3WW on 21 MHz in 2012 with 36 mW. Rogers signal was also heard in VK. The calculated lowest possible power was 5 mW. So in CW his signal would be heard with 20 * 5 = 100 mW. This seem too low, but please notice that to double the distance it takes an increase of 1 S-point (6 dB) to get the same field strength. One S-point means four times more power. Further, please notice that WSPR is patient and tireless. It is even possible that one of the operators was a sleep during the time that the spot was made. hi. I had great fun in the CQ WW DX CW contest of 2014. I had my inverted vee repaired just in time for the contest. would be in a large contest with enormous activity. I am very happy with the attenuator. As I mentioned before, the fast attenuator can be switched instandly. So I am immediately ready to answer a CQ. I started on 10 m and went to a lower frequency each time a band closed. At times when the signals were getting stronger, I tried to use a lower power in the next QSO's. On 40 m the band was too busy to use a very low power. When I was on 40 m, the other bands were closed, so all other operators were also on this band. The inverted V works fine. Since a long time I could make a few QSO's with less than 10 mW. I used a power of about 4 watts down to 1.6 milliwatts. 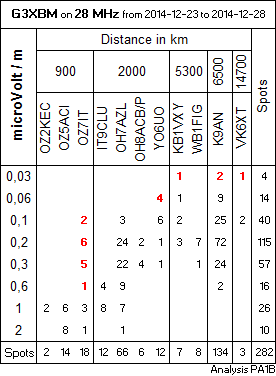 The two QSO's in the column of 2.5 mW in the table were made with 1.6 mW and 1.8 mW.